As a nation we are consuming more than 200-300kcal more than we need daily and we know excess calories lead to weight gain. Aiming for the 400-600-600 meal options will allow us to make more conscious food choices, read food labelling and control our calorie intake. A calorie (kcal) is a unit that measures energy. It’s a way of describing how much energy your body can get from eating and drinking. In order to lose weight you need to eat fewer calories than your body burns each day. To maintain or reduce your weight we need to expend our energy through exercise and eat a balanced diet that is not too high in saturated fat, sugar and salt. Your body needs calories to function and all foods and drinks contain calories. The problem is that it is very easy to consume more calories than we need and not burn them. This can have desired effects on our health such as weight gain which can cause lifestyle diseases such as heart disease, diabetes and cancer. Foods that are high in sugar, salt and saturated fat such as cakes, biscuits, chocolates, pizza, fast foods and fizzy drinks contain a high amount of calories and are known as energy dense foods and when consumed in excess your body will store the extra energy as fat. Every gram of fat is equivalent to 9kcal, every gram of carbohydrate and protein is equivalent to 4kcal. Our daily energy needs for females is 2000kcal and for men it is 2500kcal. 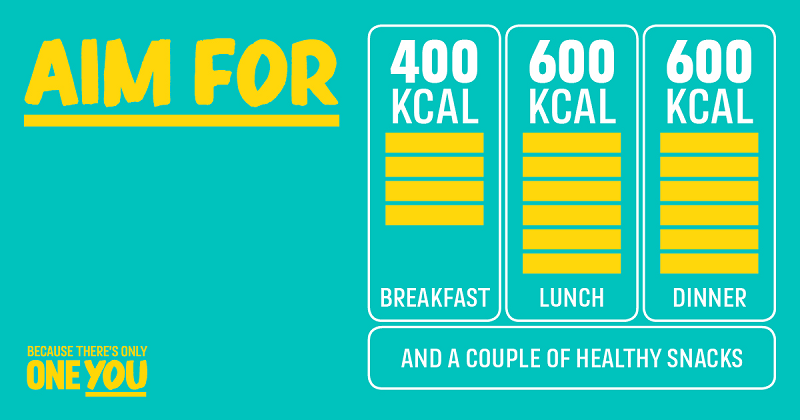 Fast foods and ready meals and some shop brought lunches such as sandwiches and pasties can contain more than 600kcal and in one sitting it is easy to go over our calorie requirements for the day. So how can we reduce our calories? By making wiser choices and small changes by far you can improve your diet! And don’t forget to EXERCISE which can prevent you from developing lifestyle diseases and help you lose weight and feel good. If you need more help in improving your lifestyle contact One You Hounslow for a healthier you! Speak to our health advisors who can motivate and signpost you to improve your health and wellbeing and check out our Cook and Eat sessions. REMEMBER THERE IS ONLY ONE YOU SO PICK UP THAT PHONE AND CALL US ON 020 8973 3530!